Our multi-utility model uniquely positions Utilities Kingston to innovate and implement change, as we continue to support our vision of building better communities. Innovation means we’re looking for new ways to exceed customer expectation, deliver quality services that local residents and businesses can rely on, and improve processes to drive productivity, accuracy of information, and openness and transparency. View Our Year in 2017 for highlights of our recent accomplishments. Employees raised $30,268 for our United Way, building our local community. 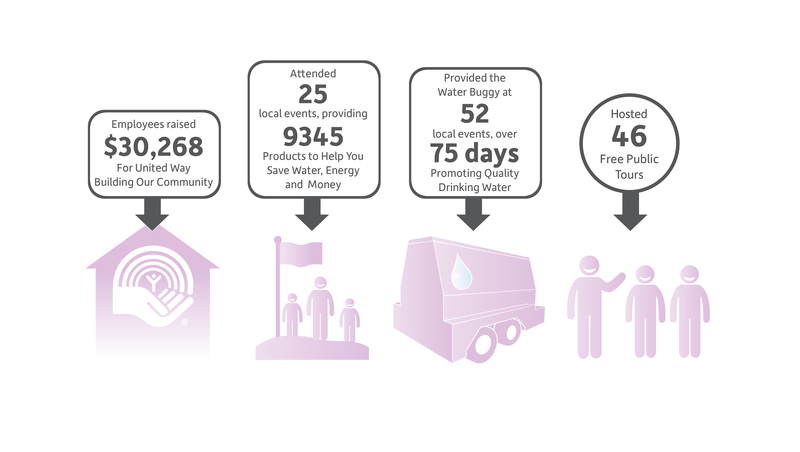 We attended 25 local events, providing 9345 products to help you save water, energy and money. We provided the water buggy at 52 local events, over 75 days, promoting quality drinking water. We hosted 46 free public tours. Public involvement helps us engage our community in meaningful conversations, as we learn to better serve our customers and support Kingston’s goal of becoming A Smart and Livable 21st Century City. We’re part of the fabric of our community and proud to serve on boards and memberships. Through local sponsorship, we give back to our community, while continued improvement and innovation are our focus on recent research partnerships. In 2017 we provided 3130 hours of health and safety training and hosted 66 training sessions. We hosted 530 delegates and 147 contracting firms at the 2017 safety days event. We hosted 800 students for electrical safety programs and conducted 252 formal staff safety evaluations. employees at our wellness day event. We responded to 7740 utility locate requests - and we responded within 5 business days, 98% of the time. We conducted 156 sewer safety inspections. Did you know that in 2017 we responded to nearly eight thousand requests to locate underground utility services and ensure public safety? We also hosted 66 health and safety training sessions, providing over three thousand hours of employee training, making sure everyone goes home safe at the end of the day. 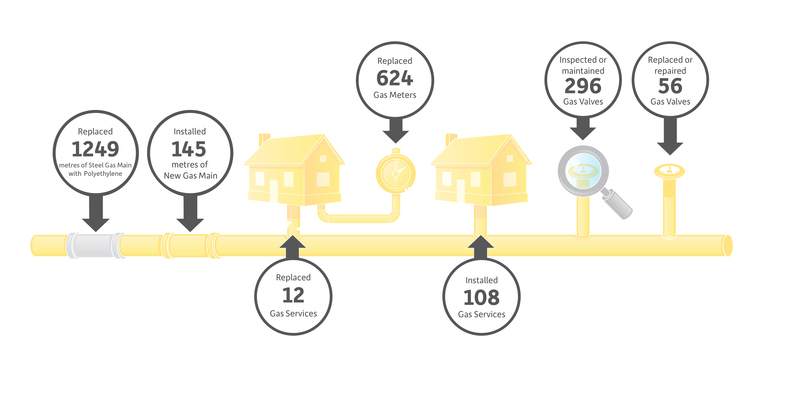 In 2017, we replaced 1249 metres of gas main, installed 145 metres new gas main, replaced 12 gas services, replaced 624 gas metres, installed 108 gas services, inspected or maintained 296 gas valves, replacing or repairing 56. We’re proud of the unique multi-utility model in Kingston. It allows for the efficient coordination of projects that combine water, sewer, gas, electricity, streetlights and traffic signals, and road works. This leads to timely and cost-effective completion of projects, with less disruption to you.